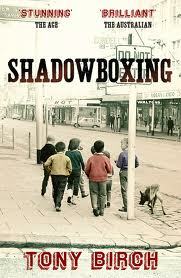 Shadowboxing is a collection of ten linked, largely autobiographical short stories set in Fitzroy during the 1960s. As such, it ticks all my boxes: Melbourne-based, baby-boomer, cumulative stories. They stand alone quite well, while building up into a longer-term, more nuanced work, and indeed apparently several had been published previously and were reworked for this collection. The stories are written in the first person by the fictional Michael Byrne, looking back as a young father on his own childhood. He was brought up in one of the sidestreets in Fitzroy where the houses were demolished as part of a slum-clearance program in the 1960s. As such, it is a vanished landscape, and many of the attitudes of the people living there have vanished too. Children had their own world, largely divorced from that of adults; people looked the other way from domestic violence in their own families and the families of their neighbours; there was an expectation that boys needed a good slap around the ears from their peers and older men to be a ‘real man’; mothers were alternately put onto a pedestal and abused. The relationship that lies at the heart of these stories is that of Michael and his abusive, wounded, father. Indeed, many of these stories are observations on masculinity and fatherhood and Birch resists the temptation to give easy, feel-good answers. Redemption and forgiveness are here, but they are both fragile and deeply ambivalent. The Melbourne depicted here, while in many ways more closely aligned with working-class slum suburbs across the world, is clearly recognizable to Melburnians. I’m surprised that ‘The Return’ hasn’t been picked up in an anthology of Australian Christmas stories because, while it describes a December Melbourne well known to Melbourne baby-boomers, it also captures the tenderness that can exist between an older brother and his little sister. These are terrific stories, honing in on small details and events and yet able to take big strides across a family’s history- indeed, across the history of a suburb and a generation- as well. Update: You might be interested in the Radio National Hindsight program about the slum clearances in Fitzroy that Andrew mentions in his comment below. Sounds like a book I would really enjoy. If you haven’t heard it, can I recommend this ABC podcast. You’re right- I’ve just finished listening to it, and it’s terrific. Tony Birch is one of the narrators. Thanks for alerting me to it.